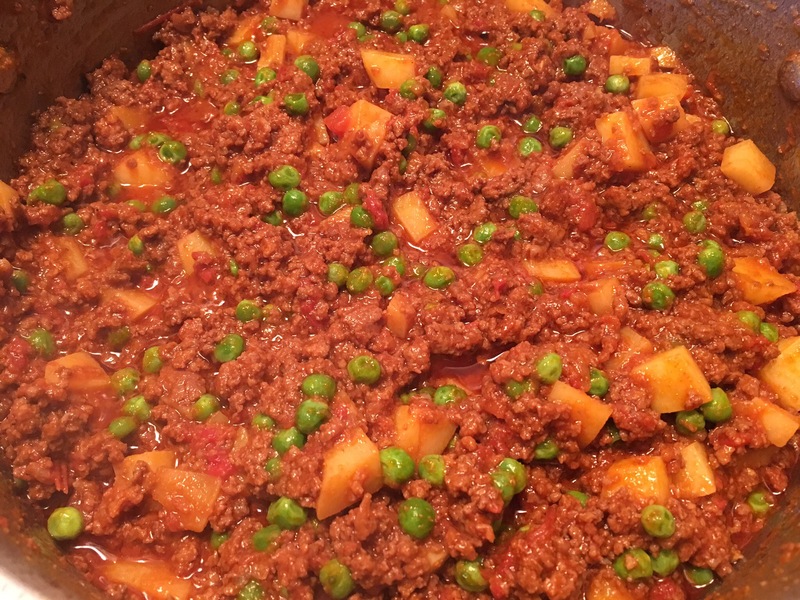 I do not use a lot of ground beef in my cooking, just for the occasional chili or meatballs, but my Indian cooking teacher Farida makes a good ground meat curry so I followed her instructions and my family enjoyed it. It is often eaten with Indian flat bread, but it is also good with basmati rice. The curry tastes best the day after you make it. Heat oil in a 4-quart pot on medium heat. When oil is hot, add onions and cook about 8 minutes until onions have softened and turn golden. Add garlic and cook 1 minute. Add ground beef, a bit of salt and pepper, and a light sprinkling of onion powder and garlic powder. Brown meat for 7-8 minutes, then add crushed tomatoes, cumin/coriander powder, turmeric, cayenne, paprika, and more salt to taste. Lower the heat slightly. Cover and let simmer for 20 minutes, then add potatoes and water. Cover and cook 30-40 minutes until the potatoes are fork tender but not falling apart. Add peas and cook 15-20 minutes longer. Garnish with cilantro if desired. Serve with Indian flatbread of choice or rice. Serves 6. This entry was posted in Beef, Meat Dishes. Bookmark the permalink.